"Monody to the Sound of Zithers" by Kay Boyle was offered by Poets.org's Poem-A-Day on March 9, 2014. A link to the poem may be found here: http://www.poets.org/viewmedia.php/prmMID/23913?utm_source=PAD%3A+Monody+to+the+Sound+of+Zithers+by+Kay+Boyle&utm_campaign=poemaday_030914&utm_medium=email. Kay Boyle (1902 - 1992) was a political activist, novelist, short story writer, political correspondent, college professor, and poet with nine published collections of poetry to her name. Thrice married, she spent about half of her life in France. She was the recipient of a Lifetime Achievement Award from the National Endowment for the Arts. Additional biographical information may be found here: http://www.britannica.com/EBchecked/topic/76494/Kay-Boyle. "Monody to the Sound of Zithers" was Boyle's first published poem, appearing in Poetry: A Magazine of Verse in 1922. The poem is presented in a kind of ballad form, in four quatrains of pentameter with a rhyme occurring in every other line. A monody is a poem lamenting a person's death. Strictly speaking, Boyle's poem is not a monody. 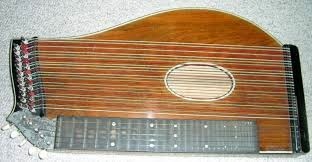 A zither (pictured) is an instrument made of numerous strings stretched across a sounding box. Perhaps the unusual pentameter in this piece was meant to imitate the multiple notes in the chords made by this instrument.